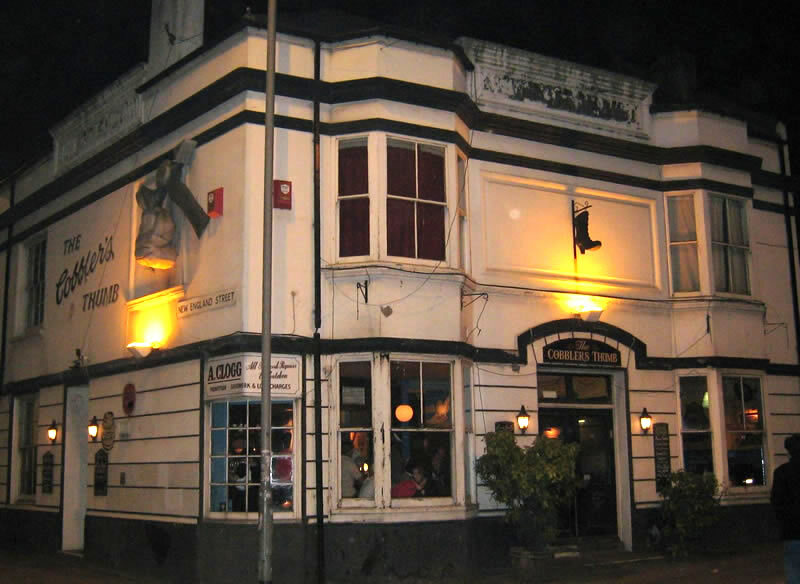 News this week that one of my old haunts is set to feel the merciless punch of the wrecking ball – The Cobbler’s Thumb, in Brighton, is finally to be demolished after years of structural neglect. The old girl will be knocked down before she falls down, though for a while in the early noughties, it seemed likely it would be the other way around. It became one of those pubs where everyone knew your name (or at the very least, alcohol-fuddled, tried to remember it) and a place in its heyday that always felt welcoming and snug. That wasn’t the case when two friends of mine became managers.. the pub was tired, it looked pretty desolate on most week nights, the only highlight (read: more than five people drinking) being Thursday – quiz night. But Geoff and Nicci gradually took charge: the decor was spruced up, the drinks range sorted, and attendance picked up. Problem: the Thursday quiz became the least popular night of the week. The Cobbler’s Thumb just wasn’t the kind of place that suited the silence necessary for a serious pub quiz with a martinet of a quiz master. It needed a buzz. A quick consultation with Geoff and I was a DJ (hey, wasn’t everybody in Brighton in those days? ), supplanting the quiz. By plugging my laptop into the pub sound system, I found my feet and aimed to please with an array of classic sounds: punk, reggae, ska, Northern Soul, 60s, glam rock, Stax, rockabilly, old school hip hop.. things which just seemed to feel right stuck together on a playlist. I started out with around 400 songs, so requests for tunes often had to be politely negotiated. “I don’t have that.. how about this?”. But I listened and learned, and would be back the following week with additions to the collection, often whole swathes of MP3s brought in by the regulars for me to play. Little traditions sprung up.. Andy’s punk “Triple Play”, and always some Hank Williams to end the evening (unless we all got locked in, of course). We played John Peel’s All Time Festive Fifty when the great man passed away. We played a couple of great all-dayers with fans of Brighton and Hove Albion and Leicester City contributing to charity. What could be better than playing music for your friends and having a couple of beers whilst doing it? Because they were my friends.. not staff, not punters, not clientele, for god’s sake.. just regular folks out for a good time, ones you were very happy to see and who made it plain they were happy to see you. The best kind of people. Those Thursday nights were very special to me. Here’s a Spotify playlist in memoriam. Good times. Previous I Don’t Want To Go To Chelsea. Oh, Wait.. I remember going it there New Years Eve around 1986-7 everyone really friendly and a few years later, when I lived in Stanford Avenue it was my regular pub. So sad to see another old pub go. Thank you Mr DJ. Think I survived a couple of the infamous lock-ins! I’m glad there are a lot of guitar players pursuing technique as diligently as they possibly can, because it leaves this whole other area open to people like me.